Mentoring is proven to be an effective practice that aids in professional career development at many levels. Consequently, more and more universities and companies are implementing mentoring programs with very positive outcomes. The nonprofit International Mentoring Foundation for the Advancement of Higher Education (IMFAHE) has taken the mentoring practice to another level by creating an innovative educational-scientific-global platform that benefits not only personal career development, but also the development of the participating universities, businesses and countries. The programs and initiatives developed by IMFAHE have been successfully implemented in Spain and are currently being expanded to other countries, including Portugal, Chile and Argentina. In only three years, IMFAHE and its International Mentor Program (IMP)-Spain have successfully recruited established Spanish professionals in the fields of biomedicine, engineering and economics/entrepreneurship (referred to as the e-Talent, from emigrated-Talent) working at top-tier academic institutions and first-class international companies around the world (including Harvard University, Massachusetts Institute of Technology –MIT-, Stanford University, Princeton University, Karolinska Institutet, Max Planck Institute, Google, Amadeus IT Group or Santander Bank, among others) to serve as mentors for grad and undergraduate students (referred to as n-Talent from national-Talent), thereby contributing to the educational, scientific, and economic development of their home country. Figure 1: Worldwide distribution of e-Talent (emigrated Talent) and n-Talent (national talent) (academic year 2015-17). The worldwide location of e-Talent is represented in red. The countries and universities where n-Talent is located are represented in blue. The role of Living Labs? Inspired by the concept of “living labs”, IMFAHE operates as an intermediary among citizens, universities, research organizations, businesses and government, allowing them to work together for joint value generation. This effort results in the co-creation of a unique open innovation educational and professional ecosystem that can provide solutions to major problems that Spain and many other societies face today, such as brain drain, high unemployment rates among university graduates and difficulties in attracting, retaining and developing talent. According to the European Commission, open innovation strategies are based on developing digital single market strategies, which bring down barriers to unlocking opportunities and creating multidisciplinary networks. Our novel project has worked in this fashion to develop an international e-Mentoring platform that enables e-Talent (mentors) and n-Talent (mentees) to have one-on-one periodic communication via video conferences and e-mail to work on specific career goals. Moreover, we have created an e-Platform called “Virtual Campus” that connects approximately 200 mentors affiliated with 57 top international organizations with over 400 Spanish students from Universities distributed along the Spanish territory in real time. In addition, we have created over thirty online seminars about career excellence, entrepreneurship and innovation best practices that have benefit more than 4,000 students so far. IMFAHE recognizes that to create innovation online tools have to be complemented with offline tools. For this purpose, every year we organize an annual conference that could be described as a “Two-Day Innovation Camp,” where mentors, mentees, universities, businesses and government representatives share ideas for how to bring innovation to the education system, companies, cities and the country, working together to encourage talent attraction, retention and development (Figure 2). Another valuable offline strategy is participation in one of our twenty-six Excellence Fellowships. Students awarded this fellowship have the opportunity to take part in a professional experience in top international labs (fifty percent of them have been hosted by Harvard University and MIT). This experience not only helps to the advance the careers of the awardees, but also allows the students to bring back renewed knowledge, new ideas, and innovation to their universities and cities when they finish the internship. Figure 2: Roundtable “Governments and Universities. 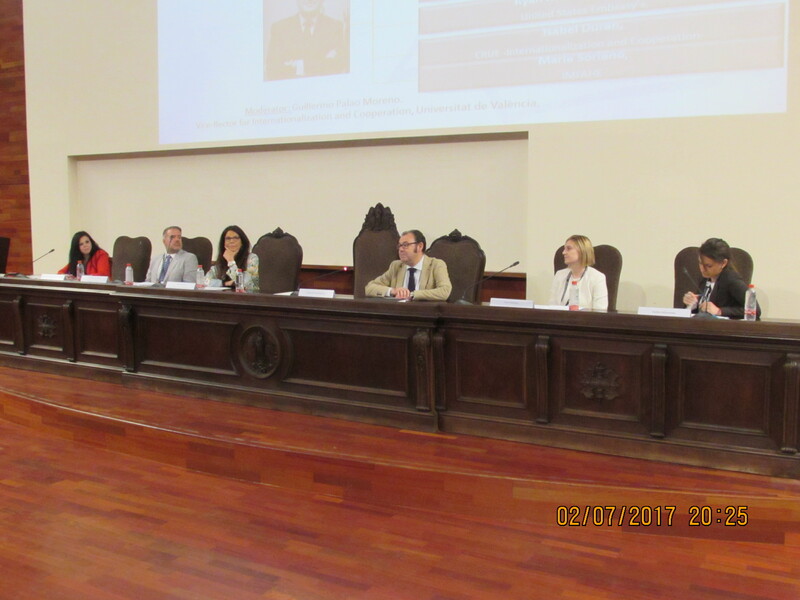 New Educational Methods with Socio-Economic Impact” at IMFAHE’s International Conference 2017-University of València. From left to right: Maria Soriano-Carot (IMFAHE Foundation), Ryan Matheny Garrido (United States Embassy in Spain), Isabel Durán (Association of Rectors from Spanish Universities -Internationalization and Cooperation-), Guillermo Palao Moreno (University of València), Laura Dominici (Spanish Government of Employment and Social Security), and Emiliya Hubavenska (European Commission, DG Connect). For the European Commission “collaboration” is an essential aspect of innovation. IMFAHE, follows the “quadruple helix innovation” concept, and through its program “IMP” and other initiatives such as “Science2.0,” “IMFAHE connect”, and “IMFAHE recruiting”, creates bridges and enables dialogue between the four main actors that lead to innovation: 1) talented citizens (e-Talent and n-Talent), 2) academic institutions (~25% of Spanish universities have collaborated with IMFAHE: Universities of València –nodule of the Spanish universities–, Valladolid, La Laguna, Miguel de Cervantes European University, Oviedo, Autónoma de Madrid, Carlos III of Madrid, La Rioja-Zaragoza-Lleida-Public University of Navarra –through Campus Iberus–, Politècnica de València, University of Navarra, University of the Basque Country, Politécnica de Madrid-Complutense de Madrid ­–through Campus Moncloa–, University of Seville-Malaga –through Campus Andalucía TECH–, International University of La Rioja, and Politécnica de Cataluña), 3) the private sector (companies interested in developing innovative projects, increasing their international visibility and recruiting the e-and n-Talent: Asti Technologies), and 4) the public sector (interested in training, retaining and/or attracting talent: Fomento San Sebastian, US-Spain Fulbright Commission, Fundación General de la Universitat de València, Harvard University, Amadeus North America, SUNY, MIT, The University of Texas, Karolinska Institutet, University of Sao Paolo, Moffit Cancer Center, Memorial Sloan Kettering Cancer Center, University of Wisconsin). Innovative ideas have to be rigorously evaluated after their development and implementation. Positive evaluation results are necessary to classify them as truly innovative. IMFAHE´s initiatives have undergone strict evaluations and the results have demonstrated their positive impact at several different levels, providing evidence for its innovative nature. Overall, IMFAHE, together with its partner universities, labs, business and the government, orchestrates the co-creation of a powerful e-Platform of multidisciplinary-worldwide talent that fights brain drain and youth unemployment, promotes talent development, retention and attraction, fosters collaborations, facilitates international knowledge flow, accelerates the incubation of new ideas and favors the development of innovative ecosystems. The content of this opinion piece does not reflect the official opinion of the European Union. Responsibility for the information and views expressed therein lies entirely with the authors.